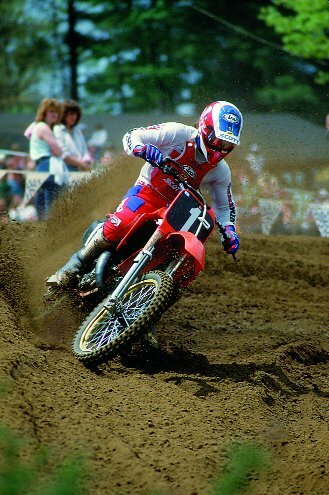 Micky Dymond was the archetype of the ?80s motocross star. He rose to almost instant fame at Southern California’s Saddleback Park. The handsome, long-haired beach boy went from Novice to Pro in less than two years. He captured the attention of Maico, which, amazingly for a German company, kept its finger on the pulse of Saddleback because of its rep for developing National stars. Dymond signed with Team Husqvarna to race the 250 and 500 classes (finishing seventh in the 1984 500 Nationals) before being gobbled up by Team Honda in 1986. At the time, the AMA had passed a rule that allowed a rider to win the 125 National Championship twice before being being forced up to the 250 class. Dymond inherited his ride when 1985 125 Champion Ron Lechien left Honda for Kawasaki at the end of the season. With Lechien gone, the 125 Nationals were wide open, with Dymond the underdog against established veterans like Erik Kehoe, George Holland, Keith Bowen, Guy Cooper, Larry Brooks, Jeff Leisk and Eddie Warren. Before the 11-race 1986 series was over, five of those riders would win Nationals, but Dymond would win three and clinch his first-ever National Championship. The following year, Micky would win five of the 12 races (that was the year the recently dropped Troy, Ohio, round was added to the National schedule) to win the crown over Suzuki’s George Holland. In his first two seasons on a 125, Micky Dymond won two consecutive AMA 125 National Championships, but it was both a blessing and a curse. Under existing rules, Dymond had to move to the 250 class for 1988, but Team Honda had no faith in him. Instead, they hired George Holland to fill his shoes in the 125 class and cut Micky loose. Shockingly, the 125 National Champion was unemployed. Luckily, Team Yamaha was rebuilding. Keith Bowen was leaving the team to ride Kawasakis, and Jeff Leisk was moving to Team Honda, leaving only Jeff Stanton and an aging Broc Glover at Yamaha. Dymond was a gamble, but Yamaha had nothing to lose while they waited for up-and-comers Damon Bradshaw, Doug Dubach and Mike LaRocco to arrive on the scene. Amazingly, Micky instantly became the star of the Yamaha team. He showed unbelievable flair on the all-new, all-white, 1988 Yamaha YZ250 (the one with the YZM-style, barn-door radiator wing). Unfortunately, he broke a knuckle in his hand at round two of the ?88 Supercross season and struggled for the rest of the year. His confidence cracked at the least opportune moment, and 1989 was also a wash. In his two years at Team Yamaha, Dymond finished eighth and ninth in the 250 Nationals and out of the top ten in both Supercross series. The disappointment of being fired from Honda after handing them two championships and the failure of his transition to the 250 class at Team Yamaha put Micky under tremendous pressure. In response, he started to go a little Bohemian. He claimed that he wanted to be a poet and became somewhat removed from the racing scene. Oh, he plodded on, racing in Europe for a season, trying his hand at the fledgling sport of freestyle, and made a recent comeback in supermoto. But motocross historians have always wondered what would have happened if he hadn’t injured his hand at that crucial juncture in his Pro career. It was a very unpoetic end for an American motocross hero.